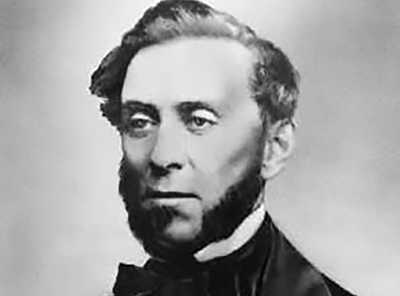 In August 1852, the Alta California exposed a brewing court battle. San Francisco's most renowned Chinese madam planned to sue a notorious Chinese leader for extortion. The beautiful Miss Ah Toy claimed that Yee Ah Tye had demanded her Dupont Street prostitutes pay him a tax. She promptly outsmarted him by doing something she never could have done in China -- threatening to take him to court. "Miss Atoy knows a thing or two, having lived under the folds of the Star-spangled Banner for three years and breathed the air of Republicanism, and she cannot be easily humbugged into any such measures. Besides she lives near the Police Office and knows where to seek protection, having been before the Recorder as a defendant at least fifty times herself. A-Thai had better be particular as to the powers he assumes, or he may find his dignity wiped away, he being dumped in the lock-up," wrote a gleeful reporter. A year later Yee Ah Tye was indeed dumped in the lock-up, this time for assault and grand larceny. Originally from Guangdong, the man one newspaper called a "petty despot" had sailed to San Francisco on a Chinese junk just before the gold rush, when he was approximately 20 years old. He spent the first night on the streets, huddled in a doorway. Yee Ah Tye had learned English in Hong Kong and before long he rose to a position of leadership in the powerful Sze Yup Association. Sze Yup, and other such Chinese organizations, met Chinese newcomers to the gold rush at the docks, gave them a place to stay, found them jobs, or outfitted them for the mines. They provided an important service for a group of people who spoke little English. But Sze Yup had dark sides too, like the use of brute force. The San Francisco Herald alleged Yee Ah Tye "inflicted severe corporeal punishment upon many of his more humble countrymen ... cutting off their ears, flogging them and keeping them chained for hours together." By 1848, when the first Chinese arrived in San Francisco, the Chinese already had an established pattern of leaving China to work in other parts of the world. High taxes after the Opium Wars had forced many peasants and farmers off their land. Several years of floods and droughts led to economic desperation. Then merchant vessels brought news of Gam Saan, or gold mountain. The majority of Chinese men who sailed to California were illiterate, but dreamed of new possibilities. Chinese miners tended to live in groups and work claims the Americans had abandoned. Initially, Americans found the newcomers -- with their wide hats and chopsticks -- peculiar and would visit Chinese camps for amusement. 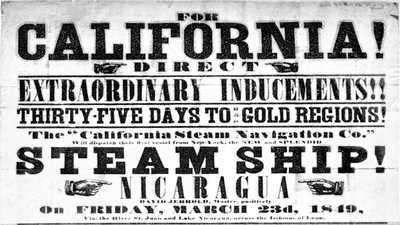 Then, in 1852, a year of serious crop failure in southern China, 20,026 Chinese flooded the San Francisco customs house. The previous year only 2,716 had arrived. By the end of the 1850s, Chinese immigrants made up one-fifth of the population of the four counties that constituted the Southern Mines. One Yankee miner complained, "Chinamen are getting to be altogether too plentiful in this country." Governor John Bigler voiced public sentiment when he suggested stemming the tide of Chinese immigration. A Chinese man responded with a letter to the Alta California, writing "The effects of your late message has been thus far to prejudice the public mind against my people, to enable those who wait the opportunity to hunt them down, and rob them of the rewards of their toil." In May 1852 the state imposed a Foreign Miners Tax, the second such tax on non-Americans in two years. This time, a levy of $3 per month was explicitly directed at the Chinese miners. And, as predicted, violence increased. 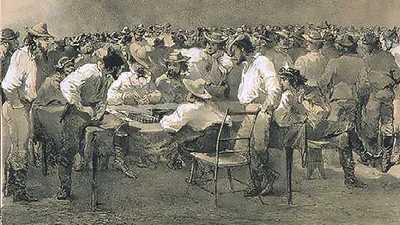 The Alta California reported that 200 Chinese miners had been robbed and four murdered at Rich Gulch. When miner Alfred Doten's camp was robbed, he blamed some convenient Chinese. "We visited our camp on the gulch and found it had been broken into so we went in and kicked up a row with the Chinese and told them we would shoot them if they stole any more." In 1854 Ah Toy was no longer able to take her grievances to court. In the case People v. Hall, the California Supreme Court reversed the conviction of George Hall and two other white men who had murdered a Chinese man. Hall and his companions had been convicted based on testimony of some Chinese witnesses. In its reversal the court extended the California law that African Americans and Native Americans could not testify in court to include the Chinese. The reversal made it impossible to prosecute violence against Chinese immigrants. Chinese men moved into other occupations, including the laundry business, domestic service and later railroad building. Yee Ah Tye became a partner in a store called Hop Sing in La Porte. By 1866 it was the richest Chinese store in that town, with a value of $1,500 (about $36,000 in 2005 dollars). 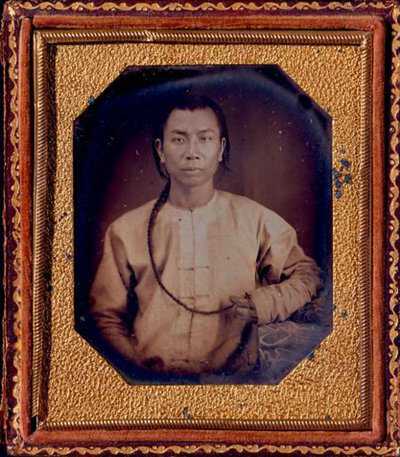 Only a few Chinese women came to the U.S. before 1880, but many of those who did served as prostitutes for people like Ah Toy. Upon arrival, they were examined and sold for between $300 and $3,000 to brothel owners or wealthy Chinese seeking a mistress. When Chinese miners sent their gold home, their families quickly assumed a prominent new place. Women married to successful miners were called "gold mountain wives." As they built new houses, they were subject to gossip and envy. Rarely did stories about the hard work and the daily discrimination faced by Chinese in America find their way across the Pacific. By 1870 there were 63,000 Chinese in U.S., 77% of whom were in California. That year, Chinese miners contributed more than $5 million to state's coffers through the Foreign Miners Tax, almost one quarter of state's revenue. In 1882, Congress enacted the Chinese Exclusion Act, the only American law to specifically bar one group from immigrating to the United States.